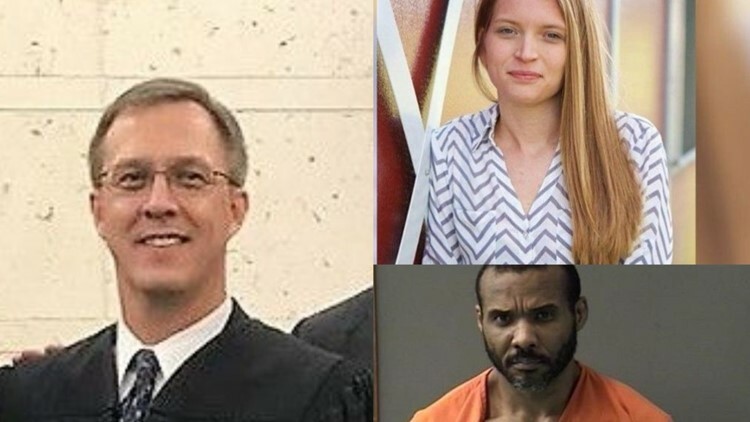 TEMPLE, Texas — The Bell County judge who dismissed a protective order Jenna Scott took out against her ex-boyfriend Cedric Marks less than a year before she was killed questioned his own ruling, according to a transcript of the Sept. 17, 2018 hearing. "I am not real comfortable with that ruling at all so be cautioned. The request is denied at this time," 264th District Court Judge Paul LePak said. The ruling came after a protective order hearing on Aug. 15, 2018, in which Scott testified Marks physically assaulted her on multiple occasions and blackmailed her into staying with him. "He wants to take away my dreams, my livelihood, and my future," Scott testified. "Anything that's important to me, significant in my life, he wants to destroy me." Marks testified in the same hearing that it was Scott who was the abuser and anything he did to her was in self-defense. "Jenna Scott would do enough just to hook, to keep me in," Marks testified. "She knew how to just do just enough to keep me going and a lot of times she beat me, she punched me." Scott was found dead, with her friend Michael Swearingin, in Clearview, Oklahoma on Jan. 15. Marks was charged with capital murder in connection with their deaths and is in the Bell County Jail with a $1.75 million bond. Scott requested the protective order in July at which time it was temporarily granted until the August hearing. Scott's attorney Carol Ann Benningfield argued Scott was in fear for her life and the people she loves. "He gets his, you know, whatever keeps him going, it comes from a place of evilness," Scott testified. During testimony, Scott described multiple occasions in which she said Marks choked her into unconsciousness. Scott described an incident in either January 2018 or December 2017, in which she said she was at Marks' house. She said she had his cellphone in the bathroom and was about to go through it. "I was in the bathroom and he came up to me and he -- he walked from behind me and he had one of his arms like this around my neck," Scott testified. Scott said she passed out and when she woke up Marks was on top of her. She said Marks then put his hands around her neck and choked her until she lost consciousness again. Scott said Marks choked her again in June 2018 when he put one hand on her neck and covered her mouth and nose with his other hand. She also said Marks' two children were in the house at the time. "I knew for sure that he was going to take my life. That's exactly how I felt," Scott told the court. During cross-examination, Marks, who represented himself, asked Scott why she never reported any of the alleged attacks to the police. "I couldn't tell my parents and have them worrying about (me), them having to fear for my life, having my friends fear for my life and I was too far down my career path to be making this known," Scott told the court. Benningfield also asked Scott about what she said Marks told her about his childhood. Scott said Marks told her there was a time when he had a desire to hurt and kill animals. She also described an incident in which she said Marks hurt his baby cousin. "And it was in a car seat. He just take(s) the buckle of the seat belt and like, hit the baby with it and he did," Scott said. Marks objected to the testimony, but LePaK overruled his objection. Once Scott's testimony concluded, Benningfield called Swearingin to the stand. However, he never got to testify because of what's called the rule of witness sequestration. After Swearingin was sworn in, Marks asked the judge if his kids could sit in the courtroom. "I am not comfortable. I don't want children in the proceeding, your Honor," Benningfield objected. LePak said he did not want them in the courtroom either, but because it was an open courtroom and they were Marks' children they were allowed to be there. Benningfield then invoked the rule of witness sequestration, which means any witnesses who had been in the courtroom during testimony were immediately disqualified as witnesses. Swearingin had been in the courtroom for all the previous testimony and LePak dismissed him as a witness. Benningfield said she had no other witnesses to call who had not been in the courtroom and she rested her case. Benningfield did not return a phone call to her office Monday. Marks' two children were not in the courtroom for any of the previous testimony, which allowed him to call both of them to the stand. Benningfield objected saying they were not competent witnesses because they idolize their father. LePak overruled her, and their testimony went on the record. One of the boys told a story of a time when he said Scott came to their house as they were leaving to go to a toy store. He said his father was in his car when Scott began screaming and banging on the car window. He said she then laid down behind the front tire. After that, he testified Scott got in the car and started yelling at Marks. "She was screaming at you and then she was leaning over to the driver's side and she had her hand out which looked like, it was to me, looked like she was trying to hit you," Marks' son told the court. Marks' younger son also spoke of the violence between Scott and his dad. He said Scott would hit and spit at his father and one time threatened to kill him. Both boys testified that Marks never threatened Scott if she left him, but said Scott would often threaten him if he tried to leave her. The majority of Marks' testimony was centered on the idea that Scott was the aggressor and he only acted in self-defense. Marks spoke about the incident in which Scott said she took his phone and he choked her. Marks told a different story saying she threw the phone at him and then ran outside to her Jeep. Marks said she later came back in the house and went into the bathroom. "She went into the bathroom and began banging her head on the counter," Marks said. "She banged her head so hard that she chipped her tooth." Marks talked about how Scott would often hit him but that he never hit her back. He said she knew he wouldn't hit a woman. "That's why she took advantage of me, hit me so much. She knew that I would never hit her back and I haven't," Marks told the court. Marks explained the alleged choking incident. He said he was laying on his bed when Scott jumped on top of him and began hitting him in the face and groin. "She would jack-hammer punch me several times before I finally stood up," Marks said. "I grabbed her by the shoulder and I spun her around and put her in what's called a rear-end choke, or as she called it a choke hold. I did do that to defend myself from her." Marks said Scott never lost consciousness and continued to talk. The hearing ended with LePak issuing a temporary restraining order until he could reach a final decision. "I'm frustrated today and I don't want to make a ruling out of frustration," LePak said. "I want to make a reasoned judicial ruling and not a frustration ruling." After the hearing, Scott reported to police that Marks broke into her home on Aug. 21. She said Marks threatened to hurt her and her family if she reported him to the police. The reported break-in was never told to LePak in the final protective hearing on Sept. 17. Benningfield told LePak there had been "additional events that has transpired since we had a hearing." LePak said he did not want the hearing to last several hours and asked, "Is it something that you all can present to me in encapsulated form of 20 or 30 minutes worth of time, or are we about to spend another four or five hours?" Benningfield said she would "refrain from presenting new evidence" and that she would present it if a motion for the court to reconsider its decision became necessary. LePak moved forward with his ruling, He said based on the testimony in August he was denying the protective order. "I am not super comfortable with my ruling, but I find that what I heard was very likely defensive measures and so I don't think it's appropriate for a protective order," LePak said. Benningfield told the judge she intended to file a motion for reconsideration. An email sent to LePak's court coordinator Debra Severson Jan. 8 had not been answered as of this publication. Jenna Scott and Michael Swearingin were last seen alive Jan. 3, 2019, according to police.